Personalized Angels T-Shirt - Personalized T-shirt for Mom or Grandma You love being a Mom or a Grandma. Now show off your kids and grandkids with this delightful Personalized Shirt for Moms and Personalized Grandma Shirts. This shirt for Mom or Grandma makes the perfect unique gift your Mother or Grandmother will cherish forever. Your Personalized Angels Shirt is available on our premium white 100% cotton T-Shirt, machine washable in adult sizes S-3XL. Free personalization includes with any title and up to 30 children or grandchildren's names. 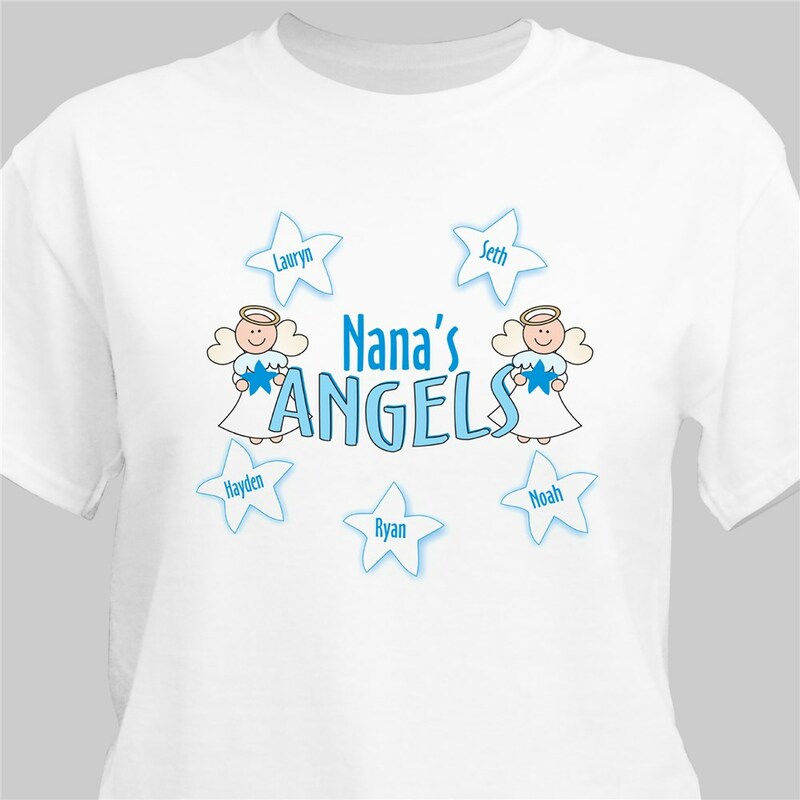 That's right your Personalized Angel T-Shirt can have any title: Mom, Grandma, Nana, Aunt Betty or any special title. The shirt turned out good, but I spelled 2 names wrong so I will have o order a new one. My mother in-law loved this shirt. She was so happy and appreciative. Thank you so much. Wasn't sure how T-shirt would look like since I only had 4 names, but when I received it I was thrilled. My oldest grandson was all smiles when he saw it as did my 2 granddaughters. My youngest grandson is to young to even know.